Sky Jack Morgan: Have You Seen High Plains Drifter? 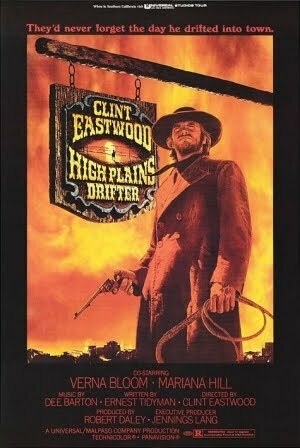 Have You Seen High Plains Drifter? Have you seen, High Plains Drifter? Clint Eastwood plays "Nameless Stranger," returning from the dead to kill everyone? What's not to love? There's nothing not to love. Basically, Clint Eastwood is a zombie or a ghost who rapes, kills, paints a whole town red, renames it Hell, and takes his sweet, sweet revenge. There are some funny parts, some parts that hold up over time and still make me cringe, and parts that reach across centuries to criticize our current societal situation. When people talk about Clint Eastwood, they bring up a lot of his films, and this one doesn't always come up. I'm not sure why; it's one of my all time favorite westerns. It seriously pushes some envelopes while adhering to a sort of western opera/fantasy that people have always seemed to love. It doesn't stoop for easy symbols of good and evil, and there isn't much room for a tale of real redemption (though there is a "little"), and no one's off the hook—maybe not even the viewer. There are of course others, but 5's good. Heavy on the Eastwood there. Yeah. But you can't have a list of favorite westerns without Eastwood, can you? It's possible. My favorite Eastwood western is OUTLAW JOSEY WALES, and although OJW would make my top ten it probably wouldn't make my top five. My favorite western is John Ford's FORT APACHE. I've never seen FORT APACHE. I'll have to check it out.